This work will be included in the forthcoming catalogue raisonné being compiled by Dr James Hyman. Michael Andrews is considered one of the giants of Post-War British Art, closely associated with the School of London of painters that frequented the drinking halls of Soho such as Francis Bacon, Lucian Freud, Leon Kossoff and Frank Auerbach. While Andrews became a part of this Bohemian group after graduating from the Slade in 1953, he was also careful to forge his own unique style that was the poetic equal of these iconic artists. Notoriously meticulous, Andrews produced less than 250 paintings and watercolours during his life and is best known for his vast landscapes of the Scottish Highlands and Australian Outback as well as the pivotal final paintings of the River Thames. Such was the air of mystery that surrounded Andrews during his life that Tate Gallery director at the time, John Rothenstein, famously wrote: ‘(Andrews is) in danger of being taken for a rumour rather than a person’. 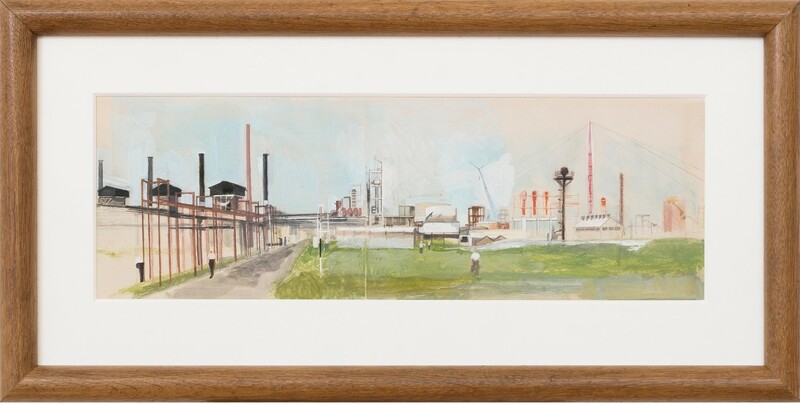 This early work by Michael Andrews is closely related to a commission from Shell Oil to contribute a work inspired by the oil industry to a group show at the Mall Galleries, London in 1955. Alongside fellow students Peter Coker, Derrick Greaves and Edward Middleditch, Andrews exhibited a painting of the Stanlow Refinery in Cheshire, tackling an entirely new subject for the young artist. The present work was likely created as a preliminary study for this early commission and focuses, in contrast, on the nearby Carrington Plant just outside of Manchester. The Carrington Estate was established by Shell in 1948 and employed over 3,500 people at its peak during the 1980s. Today only one operational chemical plant remains on the site, operated by Lyondellbasell Industries. In this image of the now defunct Carrington Plant, Andrews employs a characteristically soft and poetic technique with watercolour and pencil to conjure the mechanical structure of the plant surrounded by pastoral fields. Akin to the urban landscapes of J.S. Lowry in Northern England, a few solitary workers are scattered through Andrews’ composition to create a mysterious sense of eerie quietude. Following his early death in 1995, Michael Andrews has been the subject of major retrospectives in London at the Hayward Gallery (1980-81) and Tate Britain (2001), as well as a recent solo exhibition of his late works at Gagosian, Grosvenor Hill (2017). His work can now be found in international public collections including Arts Council Collection, London; Tate Collection, London and Thyssen-Bornemisza Museum, Madrid.